A transfer movement moves to rescind monuments and weaken the Antiquities Act. In January, Sen. Orrin Hatch, R-Utah, called the recently designated Bears Ears National Monument in his state a “travesty.” Hatch vowed to work with President Donald Trump to reverse the December 2016 designation, a stance that many other Utah Republicans have taken in recent months. Utahns like Hatch say the effort is meant to give states control over their own natural resources. Conservationists call it an attack on some of the nation’s most beloved landscapes. The attempt to abolish Bears Ears and other national monuments is part of a fresh tack in the larger push by conservative lawmakers to purge federal management from public land in the West. Five years ago, many of the Utah legislators who are now targeting monuments were focused on a different agenda: transferring federal lands to state control. State Rep. Ken Ivory’s Transfer of Public Lands Act aimed to take 30 million acres from the feds and was strongly supported by his colleagues and signed by Gov. Gary Herbert in 2012. But now, at the outset of a new Republican presidential administration that is not particularly friendly to the land-transfer idea, those 30 million acres are still under federal management. While land transfer bills continue to circulate, many of Utah’s land transfer advocates have shifted to a different tactic to undermine federal management in the West: undoing national monuments and hobbling the mechanism presidents can use to create them — the Antiquities Act. Once again, several states have followed Utah’s lead. “I think it’s harder for Republican state legislatures (to push land transfer) when you have the Trump administration, their friends, who are in charge of these federal land agencies,” says Steve Bloch, legal director of the Southern Utah Wilderness Alliance. “They’re not the enemy the way the Democrats were. (Interior Secretary) Ryan Zinke is a Montana Republican; Utah politicians don’t see him as very different from them.” Though the GOP official platform last year still included language to promote a massive transfer of federal land to state control, Trump has indicated he does not support such a move. Zinke explicitly opposes a transfer. In Utah, Herbert has signed a resolution urging Trump to rescind Bears Ears, as well as a resolution urging Congress to shrink the acreage of Grand Staircase-Escalante National Monument, which was created in 1996. In Nevada, a resolution would urge Congress to abolish Gold Butte National Monument, which former President Barack Obama created in December 2016. The bill’s sponsor, Assemblyman Chris Edwards, told HCN he has contacted members of the Trump administration about Gold Butte and is optimistic the president will see eye to eye with him. In Montana, a bill would “require legislative involvement in federal land designations.” A draft of the legislation is not yet available. In Alaska, a resolution would urge Congress to pass the Improved Monument Designation Process Act, which would prohibit the president from creating monuments without congressional approval. Similar bills have been recently introduced to Congress, including the aforementioned Improved National Monument Designation Process Act, sponsored by Sen. Lisa Murkowski, R-Alaska. The Nevada Land Sovereignty Act sponsored by Sen. Dean Heller would prohibit future presidents from using the Antiquities Act to designate monuments in Nevada. Conservative legislators have yet to completely abandon the land transfer idea, however. So far in this Congressional session, Western legislators have proposed 22 land transfer bills, according to research by the progressive advocacy group Center for Western Priorities (that compares to 22 in the 114th Congress, when several states did not hold sessions, and 36 in the 113th). In Montana, Republican Rep. Jennifer Fielder authored two transfer bills, but with the end of the legislative session just weeks away, one has yet to be officially introduced and the other is dead. Arizona had multiple bills seeking transfer of federal lands in 2015 and 2016; this year its public lands bills are tangentially related to transfer but don’t specifically call for it. Kayje Booker of the Montana Wilderness Association says she’s seeing another shift in tactics away from wholesale land transfer, with the same goal of undermining federal control: transferring management but not title. “Some of the folks that had been pushing for (title) transfer are now pushing for management transfer as a foot in the door strategy,” Booker says. In response to the land transfer efforts over the past few years, a renewed counter-movement among environmentalists and hunters and anglers also emerged. Now, the new attempts to rescind monuments and weaken the Antiquities Act has pushed that counter-movement into full gear. In January, 1,000 people descended on Montana’s capitol in Helena to advocate for federal lands (an estimated 500 attended similar rallies in past years). On April 11, Nevada legislators discussed a bill to support the Antiquities Act and Gold Butte and Great Basin national monuments, and pro-federal public lands advocates marched through Carson City and Las Vegas. 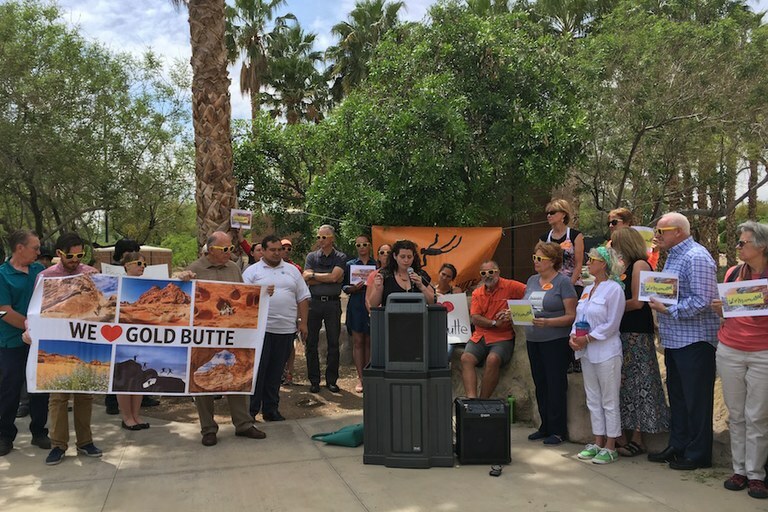 Protestors gather at a pro-public lands rally in Las Vegas in April to support the Antiquities Act and the newly designated Gold Butte National Monument. “I think we’ll hear less and less about the transfer of public lands into state hands,” says Bloch of the Southern Utah Wilderness Alliance. For him the focus is now on Bears Ears National Monument. If Trump moves to repeal the designation, SUWA and a number of partners who support the monument will challenge the decision in court. Note: Thumbnail image pictures Utah Sen. Orrin Hatch, courtesy the Leadership Conference on Civil and Human Rights, via Flickr.